Me: My next post is on brown bread. Husband: WHAT? Isn’t brown bread healthy? Husband: Because of your posts, I’m not able to buy anything from the supermarket. Please don’t write about Pringles, I beg you! A friend remarked, “Why do you keep writing “don’t eat this, don’t eat that” always? What should we eat then?" Someone who had read my post posted a comment - "At this rate we'll have to stop eating food altogether”. In the last 20 years, our understanding of food is completely taken over by packaged stuff - the so-called edible material manufactured in a factory using numerous synthetic chemicals and eaten out of plastic packets. I’m sorry I cannot place such products under the category of “foods”. Food is supposed to nourish us, give us energy, make us stronger and enable us to execute our life purpose. All that packaged foods have ever done is take us on a path of health destruction, driven by profit motives of food corporations and pharma companies. I’m an 80s girl and I have lived a small but significant part of my formative years in the pre-globalisation era in a small town. I'm so grateful to have experienced the other side, where fresh homemade food was the norm. There are plenty of foods that you can eat, if you shift your focus outside the processed/packaged foods section. 1) Take a look at your kitchen pantry. 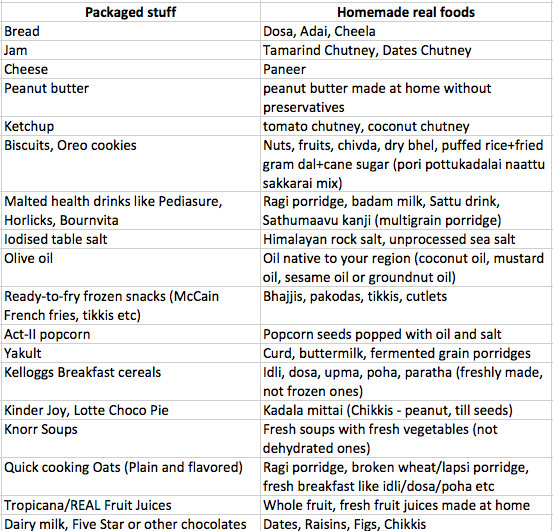 Make a list of all those packs/bottles/jars of packaged foods you have stocked up. What does the total number add up to? Do this exercise once in 15 days or once a month. Try to reduce this number every month. 2) Increase your fruits intake. 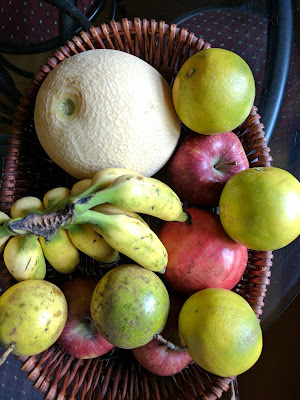 Ever since I stopped buying packaged snacks 4-5 years back, my kitchen is always stocked up with fruits. I buy fruits atleast 2 times a week. Not the exotic kiwis or avocados. But the bananas, chikkus, guavas, pineapples, papayas, seasonal fruits such as Shimla apples, pomegranates, mangoes, Coorg/Nagpur oranges etc. My 6-year old daughter eats all fruits since she has started this habit of eating fruit every single day from the time she was a toddler. 3) Stock up on dry fruits and nuts. My husband loves cashews and whenever he feels like munching something, he grabs a handful of plain cashews. We don’t stock up on chocolates, cookies or namkeen anymore. Aren’t there enough options available? The next time you go shopping to a store or order groceries online, try cutting down on all ready-to-eat packaged junk. There are many people who lead happy, healthy and busy lives without relying on packaged foods. Options are aplenty if you consciously take a step towards a packaged food-free life. Please do share your ideas for healthy substitutes in place of packaged junk. Will add it to the table above. My fiance recently shared this post with me since I force her to follow some of the same points that you mentioned above about eating Real foods instead of packaged. Just wanted to give my appreciation to your blog, you have written some very enriching articles on nutrition. To add to your table, i usually start off my day with a freshly made smoothie of plain yogurt and berries with some grounded chia seed and flax seeds. I think it can also be used as a great alternate snack in the mid-mornings instead of tea/coffee. And for a "5pm" snack idea some steamed corn and green peas with salt and pepper. Very green and nutritious. Great work Anuradha..Keep writing. Do u attend semmai vanam workshops? @Janani Krishnan, yes I have attended one of their workshops and have read many books written by Thiru.Senthamizhan. @Krish, thank you. Glad to know we share similar views on good food. Smoothies are a good idea and I prefer to add local and seasonal fruits. I also tend to use more green peas during winters, as they are available in plenty. Anuradha your blog is worth.. my mother-in-law enforces for the similar pattern of food suggestions. Keep writing. Green tea also has chemicals ? If yes please suggest some other alternative. @yogi vasu, I'm not referring to chemicals when it comes to green tea. The "miracle drink" status that green tea is bestowed upon is what I question. It is not going to help you melt your body fat or help in weight loss. The "anti-oxidants" aren't as high as the brands advertise. Many people blindly believe that green tea is the answer to all their health issues and gulp 4-5 cups a day, without thinking about their lifestyle, exercise or wholesome nutrition. along with packaged food there are few healthy alternatives...such as.. Superb article @Anuradha, worth reading it. I am going share this article as much I can. That's great stuff . Appreciate . Keep it up.